You probably remember Joyce from “Match Game” or “Chain Reaction,” but you could also be familiar with any of the 56 films in which she appeared. Years after appearing in 2 episodes of the TV series, “Perry Mason,” she decided she wasn’t done with that name and married her own Roger Perry! Perry served as an intelligence officer in the United States Air Force during the early 1950’s. As an actor, he played the title role in the TV series, “Harrigan and Son.” He also played the especially popular role of Captain John Christopher in NBC’s Star Trek episode “Tomorrow Is Yesterday.” You could also know him from any of the 91 films in which he appeared. 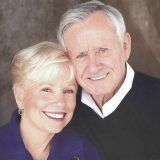 The famous husband/wife duo will appear at Snowmass Chapel on Monday, July 8th for a 7 PM performance of A. R. Gurney’s Pulitzer Prize nominated play, “Love Letters.” You will not want to miss this laughter and tears performance. We request a $20 donation for this event with a reception following in the Chapel’s Creekside Room. Admission will be available at the door (no advance sales) with General Admission Seating—so come early and get a good seat! Joyce and Roger are dedicating this performance to the memory of Ron James.